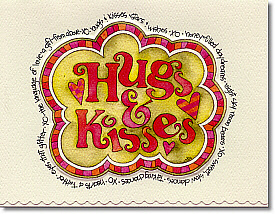 INSIDE MESSAGE: "Hugs & kisses & many good wishes for you. Happy Valentine's Day." WORD SURROUND: "Hugs & kisses. Stars & wishes. XO. Honey-filled daydreams. Night sky moon beams. XO. Sweet slow dances. Taking chances. XO. Hearts a twitter. Eyes that glitter. XO. The language of love. A gift from above. XO."